Taken out of a rough start at AAA Phoenix in July 1992, Jim Pena got the biggest news of his career, he told The Los Angeles Times later. Pena, in his sixth professional season, got his call to the majors, The Times wrote. "This is the life," Pena told The Times after arriving with San Francisco. "I can't believe I'm here." Pena made it to San Francisco and he stayed up the rest of the year. He got into 25 games, starting two. Those 25 outings marked the extent of his . Pena's career began in 1986, taken by the Giants in the 16th round of the draft out of Cal State Dominguez Hills. Pena played his first year with the Giants at short-season Everett. In 14 starts, he went 10-2, with a 2.92 ERA. He struck out 10 in a July contest to go 5-0 to that point, according to The Spokane Chronicle. "It was a typical game for me: fastball, fastball, curveball, change," Pena told The Chronicle afterward. "I just mixed it up. The key for me, as always, was throwing my offspeed stuff for strikes." Pena played 1987 with single-A Clinton, going 10-11. He then didn't play in 1988, returning in 1989 with single-A Salinas and San Jose. He made AA Shreveport in 1990 and 1991, switching to mainly relief his second year there. Pena then made AAA Phoenix for 1992. In 33 outings, two starts, he turned in a 4.15 ERA. He got his call during that early July game, taken out early in a rare start, according to The Arizona Republic. "I told him, 'Jim, that's enough,'" Phoenix manager Bill Evers told The Republic later of the conversation, "and he said, 'Why?' I said, 'Because you're going to San Francisco in the morning.' He thought I was kidding him." Pena got into 25 games for the Giants that year, starting two. He picked up one win, one loss and an ERA of 3.48. 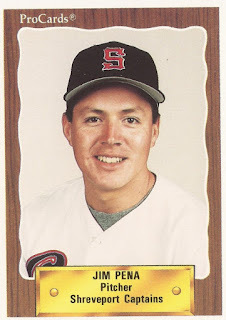 Pena moved to the Padres system for 1993, playing at AA Wichita and AAA Las Vegas, but he didn't see San Diego. After a stint at independent San Bernardino in 1994, he got into seven final outings at AAA Ottawa in 1995, ending his career.